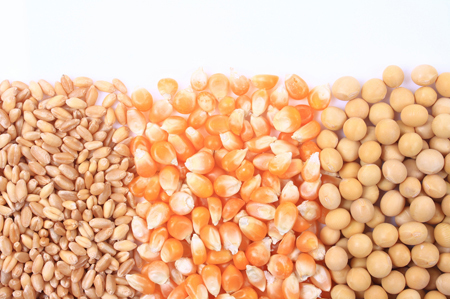 (CNBC) – U.S. soybean futures declined on Monday, retreating from a two-month high set last week, pressured by a mix of profit taking and favorable South American weather, analysts said. Wheat futures also slipped while corn futures firmed ahead of a monthly U.S. Department of Agriculture (USDA) reports this week in which analysts expect the government to lower its U.S. corn production and stocks forecasts. Most-active January soybean futures on the Chicago Board of Trade settled down 2 cents at $8.85-3/4 per bushel, after pushing above $9 on Friday. CBOT December wheat ended down 1-1/2 cents at $5.07-1/4 per bushel while December corn rose 2-3/4 cents to $3.74 a bushel. Soybeans softened on technical selling and good crop weather in South America, where farmers are planting the 2018/19 crop. “Forecasts for favorable weather over Brazil over the next two weeks and for widespread 1- to 3-inch rains over Argentine growing areas on Friday-Sunday provided heavy overhead resistance for todays trade,” DC Analysis President Dan Cekander said in a client note. There was added pressure from uncertainty about U.S. soy sales to top buyer China due to a trade row. The USDA reported export inspections of U.S. soybeans in the latest week at 1.2 million tonnes, a figure that Cekander noted was about half the total for the same week a year ago. China is the world’s biggest soybean importer and its intake of U.S. supplies has dried up after Beijing imposed extra tariffs as part of its dispute with Washington. Corn futures firmed ahead of monthly supply/demand reports due from the USDA on Thursday, in which analysts expect the government to lower its forecasts of U.S. corn yield, production and 2018/19 ending stocks. The average U.S. corn yield estimate from analysts surveyed USDA’s October report. Analysts also expect the USDA to lower its U.S. soy yield estimate, but raise its forecast of 2018/19 soy ending stocks. After the CBOT close, the USDA said the U.S. corn harvest was 76 percent complete, compared with an average analyst expectation of 77 percent. The USDA said the soybean harvest was 83 percent complete, close to the average trade estimate of 84 percent. CBOT wheat futures fell in technical trade as brokers awaited fresh news. The market drew underlying support from a decline in the U.S. dollar, which eased a day before the U.S. midterm congressional elections. A weaker dollar tends to make U.S. grains more competitive globally.